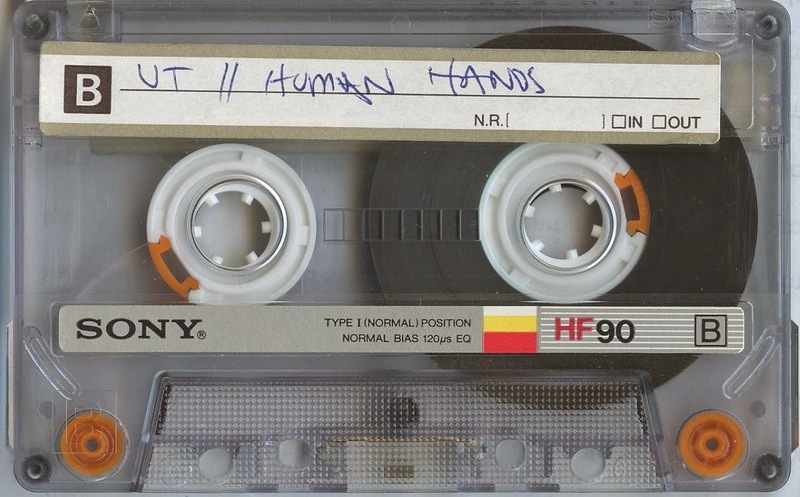 Human Hands were an Art Punk band from Los Angeles who only released a two single before splitting up in 1981. I'm not sure if track 8 is one or two songs and don't know the song title. Anyone know it? This is an audience recording with good sound quality. Elti-Fits were a Post Punk band from Manchester England. They released one 7" ep in 1980 and had a couple songs on several compilations. Their drummer was Karl Burns who had been in the Fall and was briefly in Public Image LTD in 1979. He also formed a band called The Teardrops with Steve Garvey from the Buzzcocks and played with Garvey in another band called Bok Bok. Sound quality is excellent. This band is an offshoot of the Revillos/Rezillos. The drummer is Robbie Bain alias Angel Patterson, the singer is Annie Foy aka Babs (one of the Revettes - the Revillos back-up singers), and Tony Pilley plays Harmonica, Backing Vocals, Percussion and was the owner of Barclay Towers recording studio where both the Rezillos and Revillos recorded. The band only released one single and recorded this Peel Session. The music is pure old style American Country music. Sound quality is excellent. Here's an interview done this week with Glen Matlock on the BBC. Here's two shows with Eddie Garrity (aka Ed Banger) singing. Both are rough audience recordings. Rehearsing with Wayne Barret on vocals in the summer of 1979. Does anyone know the Mainline song? Sounds like an original but could be a cover song. Sound quality is a little distorted and raw but still good. 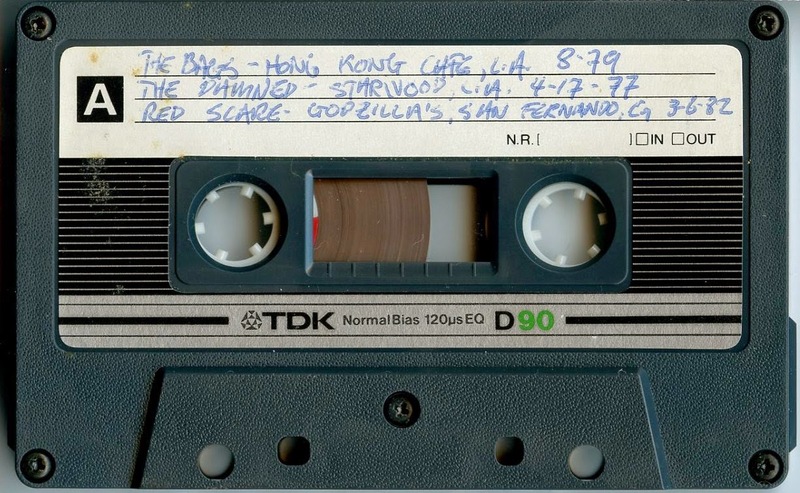 From the tape collection of Red Rossi. All four sets are audience recordings. 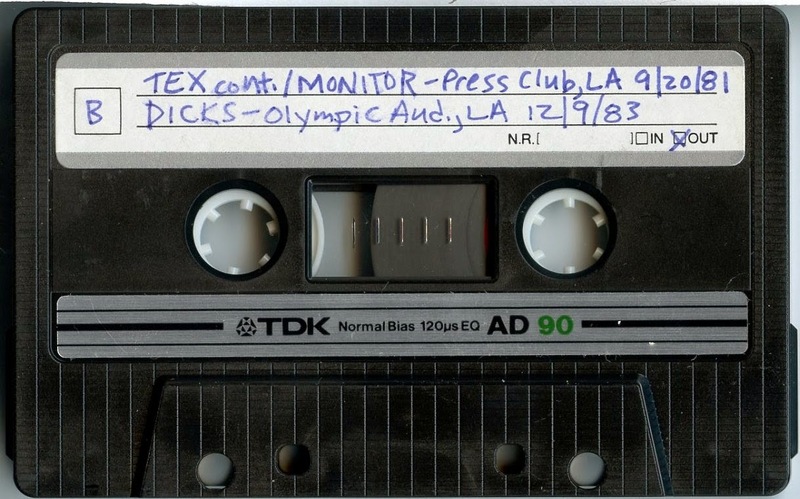 The Max's first set I posted before from a different tape source. I think this one is slightly better in sound quality. All are from the tape collection of Red Rossi. Steve Jones doesn't play on this but he is sitting in the room recording this while they were rehearsing. Two days after this recording he produced 4 of their songs in a recording studio. There are three original songs and one cover here that have never been released. Sound quality is very good. From the tape collection of Red Rossi. 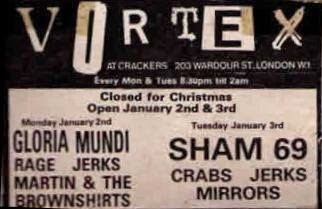 Here are the complete recordings of the bands that played a gig at the Vortex Club in London on January 3, 1978. Much thanks to the person who recorded and preserved this night in history. For those of us who were not lucky enough to have been able to be there at least we can live it and re-live it aurally. All four sets are audience records and the sound quality is generally very good. I'd say the rare gem here is the Mirrors set. While I had the three sets from the other bands for many years, until this year I didn't know the Mirrors set was even recorded. Thanks to Red Rossi in Italy for providing it. They play both songs from their first single and the rest remain unreleased. There are several other gems in their set. Nine of the twelve songs in the Jerks set were officially released on their We Hate You CD put out in 2001 by Overground Records. Tracks 1,3 and 4 are the ones left off. Everyone should know the Crabs recording by now. I've posted it on this blog a few years ago but now it can be heard in the context of the gig at which it was recorded. And the Sham set is a nice early recording of the band. Unfortunately, my tape source was missing the last three songs so I've used a recording from Red Rossi. However, his was missing the last song but I have a poor quality cdr copy and have patched the last song onto his so that at least the show is complete. Here is three of the four songs the Suburban Studs recorded for John Peel in 1977. The missing song is No Faith. Anyone have it? This was recorded off the radio and sound quality is a little raw but good. Royal Family & The Poor were a post punk band from Liverpool England who had several releases on Factory Records between 1980 and 1986. They continued on and off in one form or another until 2010. 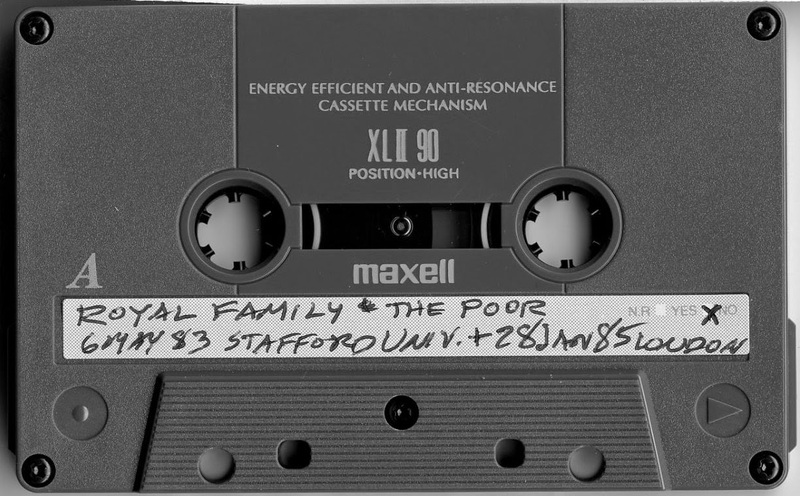 The Stafford show is a soundboard recording and had very good sound quality. Two songs from this recording were officially released in 1986 on the Live 1983-1985 LP. The demo is excellent quality. and, the London show is an audience recording that was recorded from the back of the hall. Unfortunately there are people talking throughout the recording so it is not easy to hear the band. The Dead Boys played three nights at the Roundhouse in London while touring England with the Damned. This show is from one of those nights. It's an audience recording and the sound quality is good. The Proteens were a band from Philadelphia Pennsylvania and existed from 1980 to about 1982. They recorded these four songs but never made a record. If you like 1970s style Punk you should like the Proteens. This is a radio broadcast with excellent sound quality. Audience recording. the guitar and bass are a little low in the mix. Good sound quality. this is the complete set, I believe. This one is an audience recording with good sound quality. This is an audience recording and is a little muddy but good for a couple of historic listens. Don't know anything about this band but they recorded this Peel Session in 1978 and released one 12" ep on Do It Records in 1979 that has two songs from the Peel Session on it. Here's a British Post Punk band. I haven't found any information on them on the www. Here's New York City's 8 Eyed Spy with Lydia Lunch live at two shows in California. The Mabuhay show is a soundboard recording and has excellent sound quality. It's from the Terry Hammer collection. 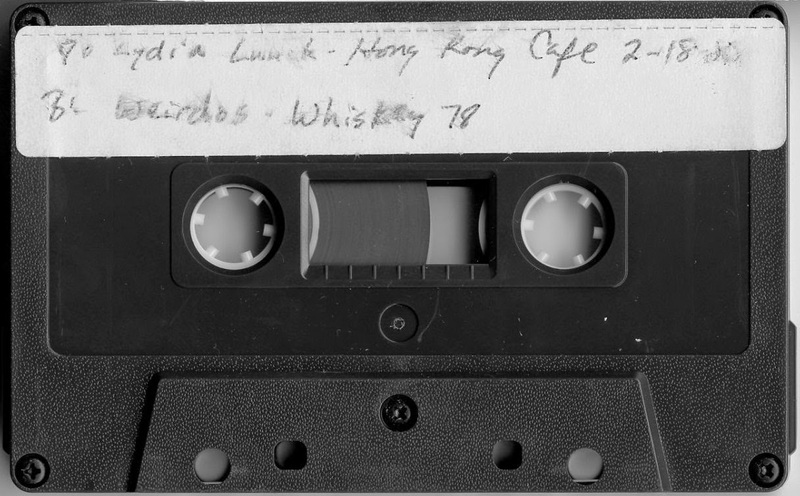 The Hong Kong Cafe show is an audience recording with good sound quality.